It’s a tough time for print media. 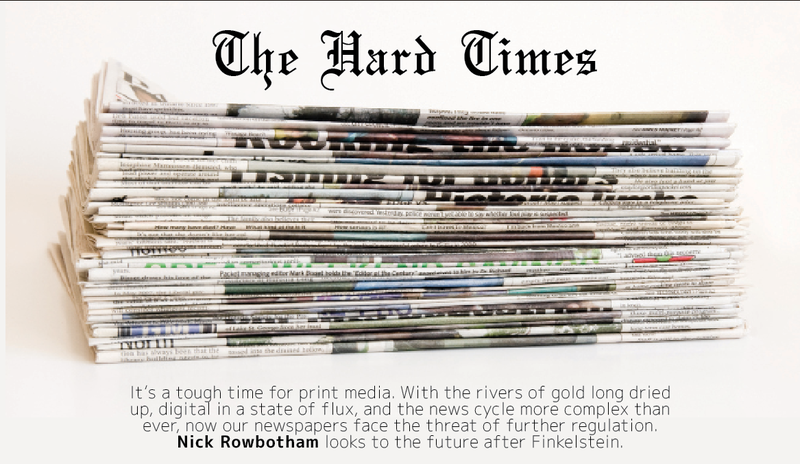 With the rivers of gold long dried up, digital in a state of flux, and the news cycle more complex than ever, now out newspapers face the threat of further regulation. Nick Rowbotham looks to the future after Finkelstein. This was The Australian newspaper editorialising last month in response to the release of the report on the Australian media by Ray Finkelstein QC. It wasn’t surprising that the report should elicit such a response from the newspaper, and indeed, other papers jumped on board too. The Australian Financial Review proffered the front page splash: “Labor plan to control the media”. As the University of Sydney’s Professor Rodney Tiffen, who worked on the inquiry, observed: “the volume of vitriol is in inverse proportion to the amount of evidence.” But The Australian’s editorial in particular, amongst a chorus of hysterical commentary, was incredibly revealing, for a number of reasons. Firstly, it exemplified the indignation of the paper – and News Limited in general – under the perception that the inquiry had, from the outset, been a politically motivated attack with the company as its target. Secondly, there was the beautiful irony of such fantastical editorial coverage of a media review, which sought to tackle issues of fairness and accuracy in the print media. And thirdly, on a somewhat related note, such remarks drew attention to the extraordinary difficulty of reporting the nuances of a 470-page report in a fair and concise way. There has been an enormous amount of commentary concerning media issues in the last few months; with regard to the Finkelstein Inquiry, Gina Reinhart’s stock raid on Fairfax, and now accusations – the result of a four-year investigation by the Financial Review – against News Corporation pertaining to the promotion of piracy. And yet, there have been almost no attempts to understand these topical events within the context of a broader discussion of the news media in this country. The commissioning of the Finkelstein Inquiry was triggered by a number of factors. Foremost was the News of the World phone hacking scandal in the UK, which brought News Corporation’s British tabloid operations into serious disrepute. Though there was no evidence that Rupert Murdoch’s Australian newspapers had engaged in any illegal activity, the ethical questions raised by the UK scandal and the subsequent (and ongoing) Leveson Inquiry have certainly reverberated throughout Murdoch’s empire. In Australia in particular, where Murdoch’s News Limited controls nearly 70 per cent of the newspaper market, the phone hacking scandal reignited discussion about the news media with regard to ethics, and issues of bias, competition and regulation. This in turn gave voice to those, mainly academics and the political left, who had long expressed concern about the nature of the Australian media landscape. Former Greens leader Bob Brown seized the opportunity and branded News Limited’s papers “the hate media”, while Communications Minister Stephen Conroy accused “some organs in the Murdoch press” of “clearly running a campaign against this government”. The aspect which generated the most discussion was, of course, the central proposal of the review; a new statutory body called the News Media Council which would replace the Press Council and regulate “news and current affairs” content across all platforms. The Press Council is the self-regulatory body of the Australian print media, and is entirely and voluntarily funded by the industry. It has no legal power to compel even corrections or retractions, and in recent years both Fairfax and News Limited have withdrawn some of their funding. Earlier this month, Seven West Media withdrew entirely. Not regulating the print media is an important democratic principle, but it is a principle built on the premise that competition and diversity will lead to self-regulation. Given the duopoly enjoyed by Fairfax and News Limited, there has clearly been a market failure in this respect. Finkelstein’s recommendation for statutory regulation is a radical one, but the outrage in the commentariat was ironically directed at a relatively minor aspect of his model, namely the ability to enforce a correction, retraction or right of reply. In many ways, this underscored that the review was fraught from the start. It was purportedly commissioned to address issues of media ethics and regulation, but were these ever the real problems? Finkelstein could hardly ignore the fact that Australia’s print media industry is the most concentrated of any in the Western world; Fairfax and News Limited together own 91 per cent of the market. The question of whether competition and diversity, rather than regulation, should be the focus of the media inquiry was limited by Finkelstein’s terms of reference, which explicitly directed it to focus on regulation. This was partly a politically motivated move, as the government did not want to endorse a review which might have led to stronger recommendations regarding the structure of the news industry, perhaps even ways in which it could be broken up to reduce concentration. But it was also a result of Finkelstein’s review coinciding with the so-called ‘Convergence Review’ – yet to be released in its final form – which is to specifically address issues of regulation and competition, particularly with regards to the emergence of new, digital platforms. Dr Peter Chen, a media scholar at the University of Sydney, believes the Finkelstein review needed to address media concentration. According to Dr Chen, the review arose “out of a section of the left wing of the political class in Australia that is unhappy with the increasing dominance of News Corporation. The general tenor of the review leads to recommendations that aren’t as strong as those on the left would like to see. It’s not going to suit anyone’s particular interests.” Dr Chen also affirms the view that competition, rather than ethics and regulation, is the core problem with the Australian media. “For a long time, the diagnosis has been a lack of competition,” he says. Interestingly, Dr Chen also makes the point that the radical aspect of the Finkelstein review is not necessarily its recommendation for statutory regulation, but rather, its overreach in proposing the establishment of an entity – the News Media Council – that would regulate all news media; radio, television, print, and online. “Finkelstein is interested in creating a class of content called ‘news content’”, says Dr Chen, which he argues would give rise to all sorts of legislative and legal difficulties in defining exactly what would and would not fall into this new regulatory category. The aversion of the print media to regulation has been traditionally grounded in the principle that a strong and independent press is essential to a healthy democracy. Indeed most of the critical responses to Finkelstein’s statutory body have invoked this principle. But equally, it can be argued that the extraordinary concentration of Australia’s print media renders it less effective at fulfilling its role as a check on executive power. Not regulating the print media is an important democratic principle, but it is a principle built on the premise that competition and diversity will lead to self-regulation. Given the duopoly enjoyed by Fairfax and News Limited, there has clearly been a market failure in this respect. The other issue that arises out of concentrated media ownership relates to the more general notion of consumer choice. Is there a demand for a wider range of news and current affairs journalism? The Finkelstein Review seemed to be concerned primarily with so-called ‘quality journalism’, leading some commentators, such as former Age editor Michael Gawenda, to condemn the Review’s “elitism” and claim that its “voice” is that of someone “who does not watch Today Tonight and who does not read the Herald Sun.” Mr Gawenda may have a point, but he commits the fallacy of assuming that there is therefore no demand for more public-interest, issue-based journalism. He also misses the point that people consume the news that is available to them, which may or may not be of a high quality. Finkelstein notes: “While market failure or a social goal establishes a necessary condition for intervention, it is not a sufficient condition for action.” The somewhat reluctant conclusion of the review is the need for a new statutory regulator, but his urgency to assure it would have no more powers than the current Press Council – beyond the ability to enforce a right of reply or correction – is telling. It is emblematic of the widespread acknowledgement of a problem regarding media ownership and competition, but the extreme reticence to do anything about it. Indeed, there are doubts as to whether anything can feasibly be done at all. Such a question is even more pertinent within the context of the recent debate surrounding ‘vested interests’ in politics, particularly Gina Reinhart’s acquisition of a 13 per cent share in Fairfax. In many ways, it seems that the horse has bolted with regard to media ownership in Australia; that as a result of a series of historical factors, Australia’s print media has grown steadily to be more concentrated. Dr Chen suggests that part of the reason for this is the ability of Australian newspapers to syndicate both internationally and locally, which has dampened competition by reducing the need to generate new content. It is often suggested that anyone is free to establish a newspaper if they so choose. But when the newspaper market is almost entirely owned by two publishers, and the main syndication agency, Australian Associated Press, is 90 per cent owned by these same two publishers, barriers to entry in the industry are significant, despite what The Australian might contend. And whilst the internet may have provided a new channel to compete with print media, it still exists in isolation and cannot entirely be considered a competitor. Of the top 12 news sites visited by Australians in 2011, eight were in fact owned by either Fairfax or News Limited, suggesting a similar dominance in the online market. And as a Centre for Policy Development brief found last year:“Newspapers are still the dominant source of ‘new news’ and play a disproportionate role in driving the overall news cycle”, highlighting the influence they exert beyond their circulation. The newspaper market is almost entirely owned by two publishers, and the main syndication agency, Australian Associated Press, is 90 per cent owned by these same two publishers, barriers to entry in the industry are significant, despite what The Australian might contend. All of this seems to lead to the conclusion that concentrated media ownership is a problem to the extent that newspapers are a commercially viable enterprise. If the newspaper is soon to be killed off by a combination of online content and new technologies, then there may be little cause for concern. One of the main barriers to entry in the print media industry is the large fixed costs associated with starting up a newspaper, but these would cease to exist if print news were delivered in a digital fashion. 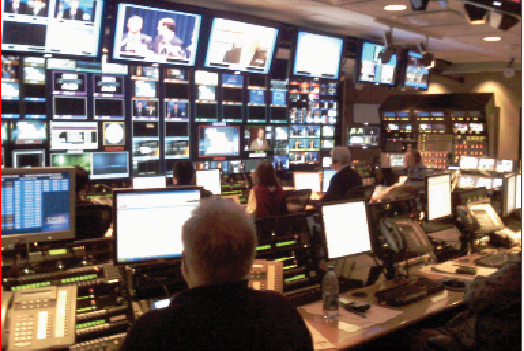 But currently the news industry exists in a state of limbo; circulations are falling steadily, and yet there has not been a wholehearted embrace of digitally delivered news, despite the emergence of smart phones and tablets. It may well be then, that a further technological quantum leap is required to revolutionise and reinvigorate the news media.